Peptide Science 2010: Proceedings of the Fifth International Peptide Symposium, Kyoto, Japan, 04.-09. Dec 2010, (Ed. : N. Fujii, Y. Kiso), The Japanese Peptide Society,2011, p 59. 40. “Biopolymer-based Nanoparticles for Applications in Drug Delivery and Immunotherapy” P. R. Wich, World Polymer Congress MACRO18, Cairns, Australia, 5. Jul 2018. 39. “Full Polysaccharide Amphiphilic Block Copolymers for Nanoparticulate Drug Delivery” P. R. Wich, World Polymer Congress MACRO18, Cairns, Australia, 3. Jul 2018. 38. “Protein-based Nanoparticles: A New Class of Multifunctional Biomaterials” P. R. Wich, World Polymer Congress MACRO18, Cairns, Australia, 2. Jul 2018. 33. “Biopolymer-based Nanoparticles for Applications in Drug Delivery and Immunotherapy” P. R. Wich, Nachwuchswissenschaftler-Workshop, GDCh Makro. Chemie, Ludwigshafen, Germany, 25. Sep 2017. 32. “Protein-based Nanoparticles: A New Class of Multifunctional Biomaterials” P. R. Wich, Bayreuth Polymer Symposium 2017, Bayreuth, Germany, 17-19. Sep 2017. 30. “Biopolymer-based nanoparticles for applications in drug delivery and immunotherapy” P. R. Wich, ACS 254th National Meeting & Exposition, Washington D.C., USA, 20.-24. Aug 2017. 29. “Protein-based nanoparticles: A new class of multifunctional biomaterials” P. R. Wich, ACS 254th National Meeting & Exposition, Washington D.C., USA, 20.-24. Aug 2017. 27. “Nanoparticle Assembly of Surface-modified Proteins” P. R. Wich, ACS 253th National Meeting & Exposition, San Francisco, USA, 02.-06. Apr 2017. 26. “Surface-modified Proteins as New Type of Biomaterials for Nanoparticles” P. R. Wich, Chemiedozententagung 2017, Marburg, Germany, 13.-15. Feb 2017. 25. “Biopolymers as Multifunctional Materials for Nanoparticulate Drug Delivery” P. R. Wich, DPhG-Jahrestagung 2016, München, Germany, 05.-07. Oct 2016. 24. “Biopolymer-based Nanoparticles: Dynamic Materials for Drug Delivery” P. R. Wich, Warwick Polymer Conference 2016, Warwick, UK, 11.–14. Jul 2016. 23. “Biopolymer-based Nanoparticles: Dynamic Materials for Drug Delivery” P. R. Wich, Global Forum on Advanced Materials and Technologies for Sustainable Development (GFMAT 2016), Toronto, Canada, 26. Jun – 01. Jul 2016. 22. “Protein-based Nanoparticles by Lipophilic Surface Modification of Lysozyme” P. R. Wich, Chemiedozententagung, Heidelberg, Germany, 21.–23. Mar 2016. 21. “Biopolymers as Dynamic Materials for Nanoparticulate Drug Delivery” P. R. Wich, 24. Nachwuchswissenschaftler-Symposium Bioorganische Chemie, Hamburg, Germany, 23.–25. Sep 2015. 20. “Acid-Degradable Polysaccharide Nanoparticles for the Delivery of Biotherapeutics” P. R. Wich, 6th European Conference Chemistry in the Life Sciences (ECCLS), Lisbon, Portugal, 12. Jun 2015. 19. “Biopolymers as Versatile Materials for Molecular Recognition and Drug Delivery” P. R. Wich, TU Braunschweig, GDCh Colloqium, Braunschweig, Germany, 08. Jun 2015. 18. “Supramolecular and Nanoparticulate Biopolymers for Therapeutic Applications” P. R. Wich, Lehrstuhl für Funktionswerkstoffe FMZ-LCTM Institutskolloqium, Würzburg, Germany, 06. May 2015. 17. “Biopolymers for Supramolecular Recognition and Nanoparticulate Drug Delivery” P. R. Wich, Frauenhofer ICT-IMM Institutskolloquium, Mainz, Germany, 13. Nov 2014. 16. “Supramolecular Recognition of Peptides and Proteins – An Attractive Tale” P. R. Wich, Reaxys Inspiring Chemistry Conference 2014, Grindelwald, Switzerland, 21.–24. Sep 2014. 15. “Dynamic Polysaccharide-based Carrier Systems for the Delivery of Biotherapeutics” P. R. Wich, 26th European Conference on Biomaterials, Liverpool, UK, 31. Aug. – 3. Sep 2014. 14. “Playing with Nature’s Toolkit” P. R. Wich, From Graduation to Innovation (GDCh/REAXYS event), Chemnitz, Germany, 24. Jun 2014. 13. “Supramolecular and Nanoparticulate Biopolymers for Therapeutic Applications” P. R. Wich, Frontiers in Medicinal Chemistry, Tübingen, Germany, 19. Mar 2014. 12. “Multifunctional Polysaccharide Nanoparticles with Tunable Degradability” P. R. Wich, SFB 1066 Seminar, Mainz, Germany, 27. Jan 2014. 11. “ Polymeric Particles as Multifunctional Delivery Systems for Biotherapeutics” P. R. Wich, Reaxys Inspiring Chemistry Conference 2013, Grindelwald, Switzerland, 22.–24. Sep 2013. 10. “Breaking the Walls of Protein Manipulation” P. R. Wich, Falling Walls Lab, Berlin, Germany, 8. Nov 2012. 9. “Acid-Degradable Dextran Particles for the Delivery of Biotherapeutics” P. R. Wich, DPhG-Jahrestagung 2012, Greifswald, Germany, 11.–13. Oct 2012. 8. “Dextran Based Particle Systems as Multifunctional Delivery Vehicles” P. R. Wich, J. M. J. Fréchet, 2nd International NanoMedicine Conference, Sydney, Australia,14.-16. Jul 2011. 7. “Surface Recognition and Inhibition of β-Tryptase by Tetravalent Peptide Ligands” P. R. Wich, C. Schmuck, 5th International Peptide Symposium, Kyoto, Japan, 04.-09. Dec 2010. 6. “Polymeric Particle Systems for the Delivery of Biotherapeutics” (invited plenary talk) P. R. Wich, J. M. J. Fréchet, ZING Polymer Chemistry Conference, Puerto Morelos, Mexico, 19.-22. Nov 2010. 5. “Acetal-modified Dextran Particles for siRNA Delivery” P. R. Wich, J. L. Cohen, S. Hornig, J. A. Cohen, J. M. J. Fréchet, 3rd EuCheMS Chemistry Congress, Nürnberg, Germany, 29. Aug – 02. Sep 2010. 4. “Artificial Oligopeptides as a Versatile Toolkit for Molecular Recognition Events – New Insights into Multivalency Effects, Protein Recognition and Enzyme Inhibition” P. R. Wich, oral presentation, 11th JCF-Frühjahrssymposium (JCF Spring Symposium), Essen, Germany, 11.-14. Mar 2009. 3. “Molecular recognition by one-armed artificial receptors in water – New insights from combinatorial methods as an ideal tool to identify peptide binders” P. Wich, oral presentation, Second Joint Ph.D. Students Meeting SFB 544/630, New Trends in Infectious Disease Research, Heidelberg, Germany, 23.-25. Nov 2006. 2. “Small and focused combinatorial libraries as a perfect tool to identify peptide binders” P. Wich, oral presentation, Intensive Course Medicinal Chemistry 2006, HoChiMinh-City, Vietnam, 02. Nov 2006. 1. “Combinatorial libraries as a tool to identify peptide binders: New insights into substrate- and sequence-selectivity” P. Wich, oral presentation, SFB 630-Colloquium, Würzburg, Germany, 17. Jul 2005. IX. “Nanoparticle Assembly of Surface-Modified Proteins” M. Fach, L. Radi, P. R. Wich, Cover Picture, J. Am. Chem. Soc. 2016, 138 (45), 14820–14823. VIII. “Degradable Dextran Particles for Gene Delivery Applications” P. R. Wich, J. M. J. Fréchet, Cover Picture, Aust. J. Chem. 2012, 1, 15-19. VII. “Multifunctional Oligopeptides as an Artificial Toolkit for Molecular Recognition Events” P. R. Wich, Ph.D. Thesis, 2009, Würzburg (Germany). VI. “Characterization of guanidiniocarbonyl pyrroles in water by pH-dependent UV Raman spectroscopy and component analysis” S. K. Srivastava, S. Niebling, B. Küstner, P. R. Wich, C. Schmuck, S. Schlücker, Inside Cover Picture, Phys. Chem. Chem. Phys. 2008, 10, 6730. 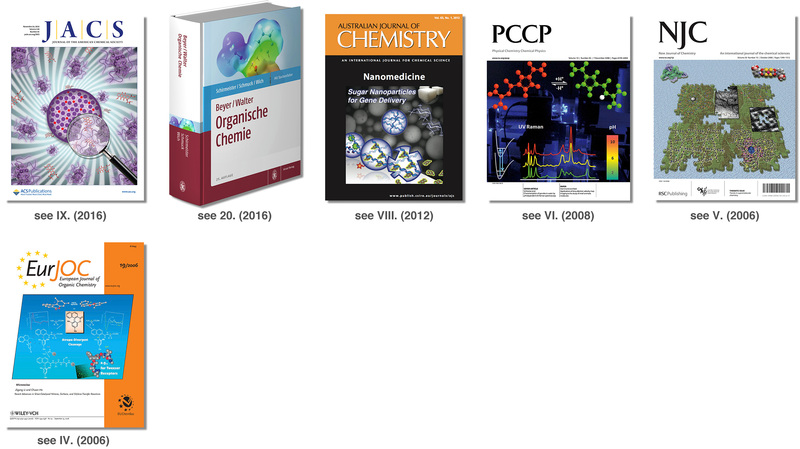 V. “Combinatorial receptor finding – small and focused vs. large and random libraries” C. Schmuck, P. Wich, Cover Picture, New J. Chem. 2006, 30, 1349. IV. “Atropodiastereoselective cleavage of configurationally unstable biaryl lactones with amino acid esters” G. Bringmann, H. Scharl, K. Maksimenka, K. Radacki, H. Braunschweig, P. Wich, C. Schmuck, Cover Picture, Eur. J. Org. Chem. 2006, 19, 4301. III. “Die strategische Entwicklung der ALTANA Gruppe mit dem Beispiel der Aufspaltung in ALTANA Pharma und ALTANA Chemie” P. Wich, Final Thesis for degree: Certified Project Manager of Business Chemistry (GDCh), 2006, Würzburg (Germany). II. “Substratselektivität künstlicher Peptidrezeptoren – Synthese und Screening einer kombinatorischen Tetrapeptidbibliothek” P. Wich, Diploma Thesis, 2005, Würzburg (Germany). I. Author of monthly published column “World Wide Web – Tips” in Journal of the German Chemistry Society (GDCh) “Nachrichten der Chemie” (Blaue Blätter), (Dec 2002 – Dec 2005).